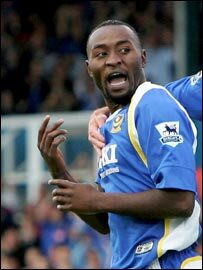 DR Congo and Portsmouth striker Lomana Lualua is battling to be fit as his side fights relegation from the English Premiership. But his manager Harry Redknapp says he will not gamble with the player's fitness in their must-win clash with Sunderland on Saturday - even though he has half his first team under treatment. The 25-year-old is desperate to face the already-relegated side after missing Pompey's last two games through a self-inflicted foot injury. Lualua damaged the foot celebrating his equaliser with a spectacular back-flip sequence in a 1-1 draw against Arsenal last week and has not been able to train since. "We will have to wait and see," said the Congolese international, who had originally promised not to relaunch his trademark somersault until Pompey were safe. "It is frustrating being left on the sidelines when the results are so vital but it still hurts when I run and I can't tell what is going to happen at this stage." Boss Redknapp revealed the injury was only bad bruising. "He is in a bit of pain and there is no way I could even have him on the bench if he wasn't fit." "He hoped to play against Middlesbrough last Saturday but failed a late fitness test - and didn't feel any better when he tried it for Monday's game at Charlton. "We've got three games left now to get back out of the bottom three and I couldn't send him limping on from the bench. "I might as well sit him there on crutches." Lualua's header against Arsenal was his fourth goal in four games but the attack looked blunt without him against Boro - when they missed a string of chances in a 1-0 win - and against Charlton, who came from a goal down to win 2-1. "I haven't said anything to him yet about the celebration," Redknapp admitted. "I just want to get him back on the pitch first. We need everybody fit."